The vast swathe of the Kidland Forest sweeps down from the high horseshoe of hills lying to the north of the sleepy Upper Coquetdale village of Alwinton. It is a forest full of secrets, where a multitude of burns feed the delightful River Alwin. To the west, the huge bulk of Shillhope Law rises between the narrow valley of the Usway Burn and the twisting River Coquet. This is a walk of contrasts, a journey along quiet forest tracks and an ancient drover`s road, a stroll beside bristling burns and a climb over high lonely hills. So fasten up your sack and let the show begin. 1. The tiny village of Alwinton lies on the southern edge of the Cheviot Hills and has one public house. It was here, at the Rose & Thistle, that Sir Walter Scott stayed whilst carrying out research for his 1818 published novel Rob Roy. On leaving the car park at the centre of the village, retrace your steps past the Rose & Thistle and, where the road turns right, continue straight across the village green and over the tiny wooden footbridge which straddles the Hosedon Burn. As you turn left you are on Clennell Street, an ancient drover`s road which wanders over the hills to the Scottish border at Hexpethgate, a route you will follow for the next three quarters of a mile. The track is clear so, as you climb gently uphill, take the opportunity to enjoy the views which open out as you begin to gain height. 2. Follow the track as it continues to wind uphill, climbing over the near vertical ladder stile adjacent to a large metal gate, before passing on your left the Iron Age settlement and fort topped Castle Hills and on your right the cottage of Clennellstreet. When the main track bears slightly to your left there is an arrowed fingerpost and at this point you need to go straight ahead to cross the post and wire fence via a small step stile or the adjoining gate (GR NT920074). There is another gate to go through within 100 metres. 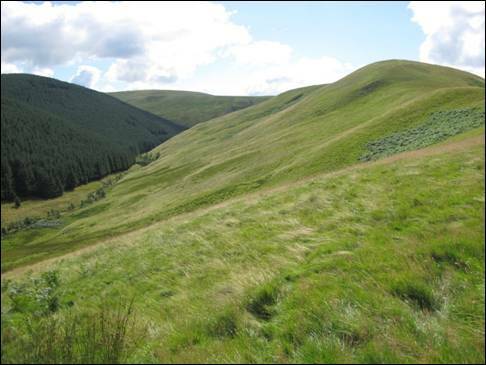 The clear path follows the edge of the hillside and there are excellent views to the River Alwin below and to the high hills beyond the forest. In a short while the path makes a wonderful descent to the valley floor, culminating at Kidlandlee Dean and the entrance to the Kidland Forest (GR NT920091) where much tree harvesting has taken place over the past few years (as at 2016). As part of the Forestry Commission`s replanting programme it is intended that the Sitka spruce, larch and other conifer mix that once stood within the dean will, in due course, be replanted and supplemented by broadleaved species along its southern edge. As you continue your journey you will encounter further areas of the forest which have also been harvested some of which will have been replanted. This is, after all, a commercial forest. 3. Cross the cattle grid and take the main track into the forest. When you reach the top of the incline ignore the track which bends away to your left and which eventually leads to the farmstead of Kidlandlee. Instead drop downhill and before long you will cross the River Alwin, emerging into a clearing with a subsidiary track turning away sharply to your right. Continue along the main track for little more than 400 metres to the point where the White and Yoke Burns merge to form the River Alwin. At this junction (GR NT917104) you can either cross the infant River Alwin by a wooden footbridge or ford the Yoke Burn slightly upstream. Whichever choice you make you will join the track which heads initially westwards alongside the White Burn. You are now heading into the heart of the Kidland Forest. Covering an area of some 5,190 acres the forest was planted between 1953 and 1987 with harvesting commencing in the mid-1990`s. 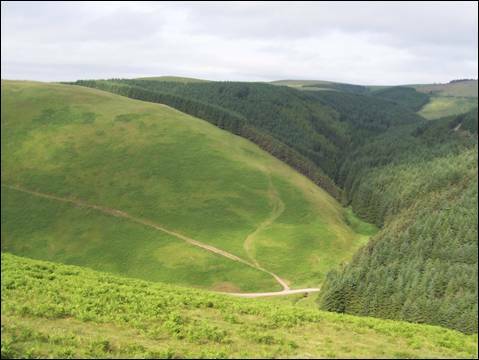 As you travel through the forest from this point and until you eventually leave the conifers behind beneath the slopes of Kyloe Shin, please be aware that there will be areas which have been stripped of their green cloak. This is an ever-changing environment where harvesting operations continue so please follow any instructions that might appear on notices erected by the forestry contractors. 4. Your route follows the White Burn for the next 2 miles so take care to follow the track which turns to your left after just over half a mile. 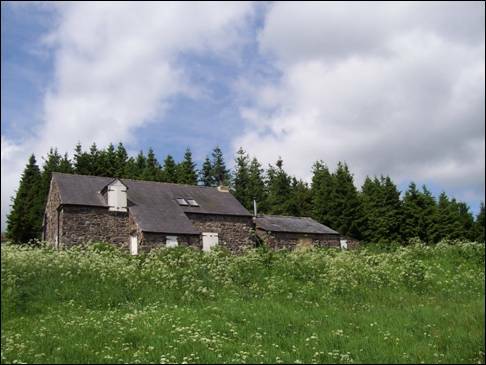 In time you will start the short sharp climb to Whitburnshank, a building last used as a permanent dwelling in the early 1960`s and currently used as an outdoor centre for young people (GR NT899123) although there is a possibility (as at November 2016) that this use may cease in the very near future. After some 5 miles of walking, this is a perfect place to take a short break and to savour the sublime peacefulness of the forest. Glance down the hill you have just climbed and you will see the remains of an old sheep pen together with a tin hut, once used to store tools such as clippers, markers and iodine. These are reminders that this was sheep country long before the trees were planted. As you leave the building behind you now enter an area of the forest which was harvested a number of years ago and you will need to follow the track as it bends to the left and, for a short stretch, heads southwards. When you reach the five-bar gates and you merge with another track (GR NT893117) you will need to turn right, heading initially northwards. You are now back on Clennell Street. 5. Continue until you reach another track, on your left (GR NT882125), and follow this, over level ground at first and then steeply downhill, to the now refurbished former shepherd`s cottage of Fairhaugh (GR NT876122). Turn right behind the cottage and cross the chattering Usway Burn, by the wooden footbridge, before turning left to follow the track as it climbs away from the burn. On reaching and crossing the ladder stile at the forest boundary (GR NT873120) your route heads south eastwards up the 433 metre high Kyloe Shin (GR NT877113) on a clear green track. Whilst there is no obvious path over the top of this hill there is a visible quad track across the grassy col towards Shillhope Law. So strike generally south westwards at first and then southwards, with the valleys of the Usway Burn and the River Coquet below you on either side. 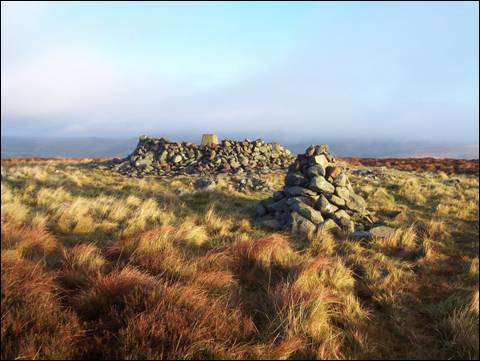 When you eventually reach the gate, climb over and follow the path which rises steeply, over rough wet ground, alongside a fence to emerge close to the trig point and small lough on the summit of Shillhope Law (GR NT873096). 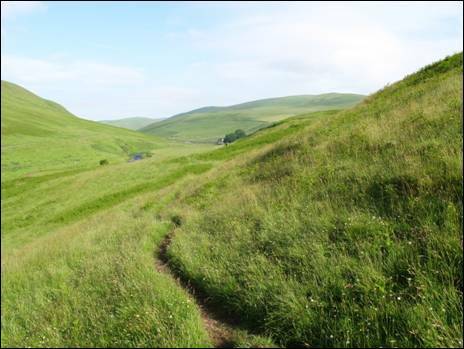 Walk 100 metres north westwards for spectacular views of Upper Coquetdale and the Border Ridge. 6. From the trig point, descend on either of the two tracks, with the fence line on your left, as far as the col, before crossing the fence via a gate, and then climbing to the top of Inner Hill. Here there are good views down into Coquetdale. Continue down the grassy track, with the fence on your right, which in turn becomes a stone wall, until you reach the rough gravel track running alongside the Usway Burn. Turn right and follow the track behind the old farmstead of Shillmoor until you reach the access road to the house (GR NT886077). This is now used by the Army as part of their dry training area, so do not be surprised to see army vehicles and personnel hereabouts. There is no cause for concern. Turn left in front of the house and proceed through gates to cross the Usway Burn via a somewhat dilapidated concrete bridge or the adjoining new wooden footbridge. Continue to walk straight ahead close to the wall on your right, crossing a small burn tumbling down from your left, before contouring the Knocks on a clear single line path. 6. You are now aiming for the path which diagonally climbs the steep hill directly in front of you. This is the Pass Peth and it is most certainly the sting in the tail of this testing walk. As you climb the ever steepening final section, you will understand why. It is hard to imagine that on these exposed heights, some four centuries ago, the men of Upper Coquetdale kept watch, night and day, guarding against the incursions of the Scottish freebooters. From the top of the path (GR NT897068), the view up Coquetdale is outstanding. The going is now almost all downhill, firstly across the south western end of Green Side and then on to the valley road (GR NT906065) for the final easy mile back to Alwinton. 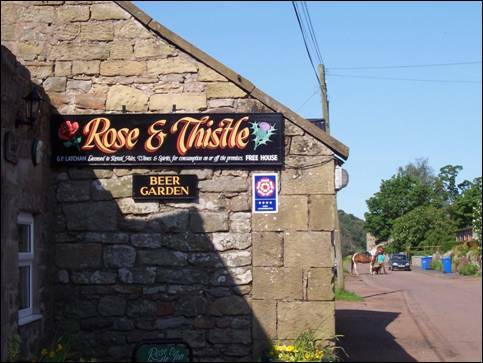 Now it is time to take off your boots and relax in the tiny Rose and Thistle public house which has been welcoming weary travellers since 1750. It is the least you can do.